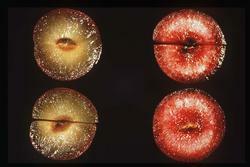 Internal breakdown (IB) is the main limiting factor in the shipping of some stonefruit. This is the most frequent complaint by consumers and wholesalers. Flesh browning, flesh lack of juiciness due to leatheriness or mealiness, black pit cavity, flesh translucency, red pigment accumulation (bleeding), and loss of flavor. IB symptoms normally appear after placing fruit at room temperature while some ripening is occurring, following cold storage. For this reason, this problem is usually experienced by the consumer, not the grower and/or packer. Stonefruit cultivars vary greatly in susceptibility to IB injury and some of them show no apparent susceptibility when grown under California climatic conditions. Among peaches and nectarines, early season cultivars are least susceptible and late-season cultivars are most susceptible. Among plum cultivars there is no seasonal pattern of susceptibility. Even under the best storage and handling conditions [0°C (32°F) and 90-95% RH], stonefruits have a limited postharvest life (Table 1). As these ideal conditions do not usually occur during the storage, transportation and handling at the retail end, the maximum potential postharvest life of stonefruit cultivars is never reached and therefore normally is shorter than that given in Table 1. The ideal way to eliminate this problem is to produce cultivars with resistance to it. In the meantime, temperature management is the best tool commercially available to delay the onset of IB. Storage below 0°C (32°F) but above the freezing point is beneficial to delay IB symptoms and extend market life. Use of controlled atmosphere (CA) conditions in combination with temperatures close to 0°C (32°F) has shown beneficial effect in extending the postharvest life of plum, nectarine and peach cultivars. CA treatment reliability can be attained by understanding the role of fruit size, canopy position, cultivar market life and shipping period. Avoid cultivars that are susceptible to IB whenever possible. - Keep fruit near 0°C (32°F) during storage and transportation. - Avoid 2-8°C (36-46°F) temperatures during retail handling. Educate warehouse and retail handlers on how to reduce IB incidence and severity.